Atomos Ninja Blade comes with an inch-perfect simple design that makes it an easy-to-use model extremely reliable to its functionality. It comes with a silky smooth, 5.1" SuperAtom IPS, a capacitive touch screen that responds in lightning speeds to gestures. For smooth production using external devices, it is important for recorders to have synchronized capturing timecode and triggering record. 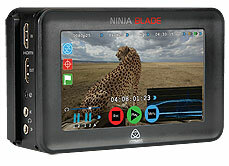 The Atomos Ninja Blade model gives users accurate timecode and starts/stop triggers when used with other leading camera brands such as Sony, Canon, Nikon, Red, JVC, and Panasonic. In the event of a catastrophic event, the OS5 is developed to detect broken files within two frames and reconstruct them for immediate recovery. This ensures that you do not lose important moments from your recording. The camera comes with two channels of digital and audio record channels, a line out and headphone jack to ensure that your audio needs are well taken care of. The Ninja Blade makes sure that you never lose sync, or your audio does not drift through frame-locking all audio including analog and digital.